Says "566,000 crimes" were "made in Texas by criminal aliens in the last 6 years." By W. Gardner Selby on Thursday, January 25th, 2018 at 11:17 a.m.
Dan Patrick, seeking a second term as lieutenant governor, posted a figure that didn't prove out in this January 2018 Facebook post (screen grab). Lt. Gov. Dan Patrick, seeking re-election, entered 2018 by warning on his campaign’s Facebook page that "criminal aliens" committed more than 500,000 Texas crimes in recent years. We wondered about Patrick’s declaration in part because we’d just found scant data about Texas crimes committed by individuals living illegally in the United States. Also, research rooted in U.S. Census Bureau data suggests that nationally, unauthorized immigrants commit few crimes. For that other fact-check, we calculated from annual state-posted crime reports that the 170,000 arrests of "criminal immigrants" proclaimed by a Texas House member at a 2015 hearing represented about 4 percent of all the adult arrests in the state from 2011 through 2015. But absent expert analysis, we wouldn't brandish that percentage as a fact. Here’s Patrick’s statement on Facebook, which he presented against the backdrop of a wire fence: "566,000 crimes made in Texas by criminal aliens in the last 6 years." We took that to mean that "criminal aliens" were found guilty of 566,000 crimes over six years. Then again, text in smaller print to the right of Patrick’s fence-backdropped statement offers a different interpretation. That text says: "In the past six years, criminal aliens have been charged with more than 566,000 crimes in Texas including kidnapping, homicide, burglary, and much more. There is no excuse for endangering our communities by allowing criminal aliens who have committed a crime to go free." Some perspective: We estimate, starting from Texas Department of Public Safety annual crime reports for 2011 through 2016, that there were 5,513,663 adult criminal arrests in the state in the six-plus years referenced by Patrick. If the 566,000 figure offered by Patrick solely reflects arrests, he was referring to about 10 percent of adult arrests in the state. We asked Patrick, a Houston Republican who touts his support for a secure U.S.-Mexico border in a fresh video ad, about the basis of his 566,000 "crimes made" statement. A spokesman, Alejandro Garcia, replied by email: "We have answered this question many times." Garcia provided a link to a familiar DPS web page, "Historical Arrest and Conviction Data for Select Offenses Associated with Criminal Aliens:"
Adding up the chart’s tallied arrests, covering 11 crime categories, gets you to 638,411 arrests "associated with criminal aliens." And did all those arrests occur in the six-plus years noted by Patrick on Facebook? A related DPS web page noted by Garcia, "Texas Criminal Alien Arrest Data," says that according to Department of Homeland Security "status indicators, over 240,000 criminal aliens have been booked into local Texas jails between June 1, 2011 and December 31, 2017. During their criminal careers," it says, "these criminal aliens were charged with more than 638,000 criminal offenses." We read "criminal careers" to refer to the booked individuals’ lifetime rap sheets. More from the DPS page about those "career" arrests: "Those arrests include 1,300 homicide charges; 76,044 assault charges; 18,126 burglary charges; 76,660 drug charges; 774 kidnapping charges; 43,591 theft charges; 49,154 obstructing police charges; 4,180 robbery charges; 6,878 sexual assault charges; and 9,561 weapon charges." Unmentioned in that text: 352,143 of all the tallied arrests, 55 percent, were for "all other offenses," according to the DPS. According to DPS criminal history records, the agency says, those 638,000-plus criminal charges "have thus far resulted in over 286,000 convictions." The conviction count presented on the chart offered as Patrick’s backup indicates 286,101 convictions. The DPS page says the convictions break out to 547 homicide convictions; 28,592 assault convictions; 8,915 burglary convictions; 37,581 drug convictions; 268 kidnapping convictions; 19,803 theft convictions; 24,084 obstructing police convictions; 2,153 robbery convictions; 3,164 sexual assault convictions; and 3,973 weapon convictions." Its text on the web page doesn’t mention the 157,021 included convictions for other offenses accounting for 55 percent of the total convictions. We spotted a couple other wrinkles. DPS’s web page indirectly reminds that a "criminal alien" isn’t necessarily someone living in the country without documentation. "Of the total criminal aliens arrested in that timeframe," the page says, "over 160,000 or 66% were identified by DHS status as being in the U.S. illegally at the time of their last arrest." We noticed too that the DPS doesn’t specify how many of the noted arrests or convictions through criminal careers tie to the 160,000-plus people believed to be living here illegally at the time of their latest arrest. Our requests to the DPS to corroborate Patrick’s 566,000 figure didn’t yield additional information. Patrick said that "566,000 crimes" were "made in Texas by criminal aliens in the last 6 years." We didn't find a factual path to this figure and, in fact, spotted no state-posted information specifying a relevant count of criminal arrests or convictions for the six-plus years singled out by Patrick. The DPS has said that more than 638,000 charges and over 286,000 convictions were accumulated through their "criminal careers" by more than 240,000 "criminal aliens" booked into Texas jails in the six-plus years. Unsaid: Some of those people were living in the U.S. with legal authorization. We find Patrick’s statement inaccurate and ridiculous. Pants on Fire! 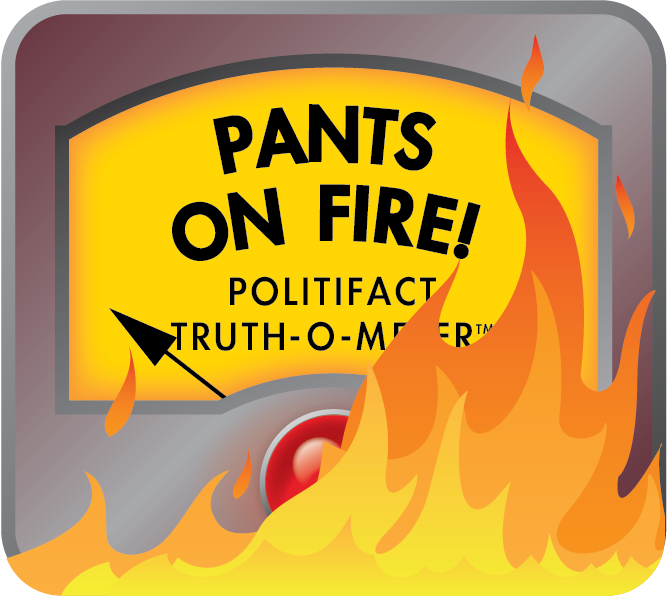 PANTS ON FIRE – The statement is not accurate and makes a ridiculous claim. Click here for more on the six PolitiFact ratings and how we select facts to check. Published: Thursday, January 25th, 2018 at 11:17 a.m.